Located in the heart of New Orleans, St John Trace is quintessential NOLA city living at it's finest. This unique community is comprised of homes that offer modern luxury and amenities while maintaining the character and charm that is distinctively New Orleans. Scheduled to begin construction in the first quarter of 2016. This community is being built by Chisesi Signature Homes, and the homes are true to the Chisesi style and brand featuring luxury residences in a wide variety of styles, along with practical amenities. In the center of New Orleans you find the neighborhood we lovingly refer to as Mid City. It is a diverse neighborhood with multiple historic architectural styles and residents spanning a variety of ages, races and income levels. Bayou St John runs through Mid City and provides a backdrop of kayaking, canoeing, and picnics along the grassy shore. Along with its proximity to City Park, these unique recreational assets make Mid City one of the best communities for active residents. New Orleans Museum of Art (NOMA) - New Orleans’ oldest fine arts institution, opened on December 16, 1911 with only 9 works of art. Today, the museum hosts an impressive permanent collection of almost 40,000 objects. The collection, noted for its extraordinary strengths in French and American art, photography, glass, and African and Japanese works, continues to expand and grow, making NOMA one of the top art museums in the south. The 5 acre Sydney & Walda Besthoff Sculpture Garden at NOMA is one of the most important sculpture installations in the United States, with over 60 sculptures situated on a beautifully landscaped site amongst meandering footpaths, reflecting lagoons, Spanish moss-laden 200-year-old live oaks, mature pines, magnolias, camellias, and pedestrian bridges. With a history dating back to 1872, the Fair Grounds Race Course is the third oldest continuously operating thoroughbred racetrack in the United States, and one of the most famous. Racing season at the Fair Grounds runs from Thanksgiving weekend through the end of March the following year. Many featured races and “handicaps” are held throughout the season, including the prestigious Louisiana Derby just before the end of each season. The annual New Orleans Jazz & Heritage Festival is also held at the fair grounds. It typically has twelve stages featuring virtually nonstop music, more than 60 food booths serving up plate after plate of food that is widely regarded as the best music festival cuisine in the world, and three nationally recognized crafts areas showcase an unparalleled array of original arts and crafts. Bayou St. John offers a beautiful waterway in New Orleans where you can have fun doing water sports like paddleboarding and kayaking. 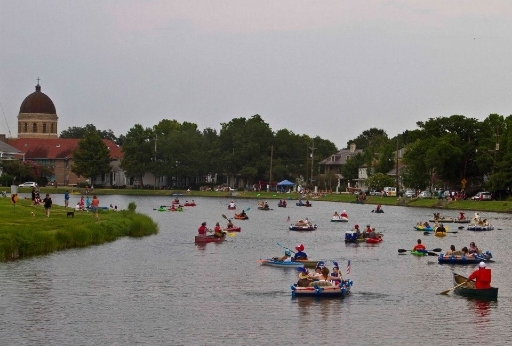 Every year in late May, Bayou Boogaloo comes to the shore of Bayou St John. This festival features music, food, arts and handcrafts, and other sensory delights. It goes on for three days and stages are set up in several widely separated locations so the music on one stage doesn't clash with another. Fest-goers can leisurely stroll about, grab some great New Orleans signature food items and a cold drink then go sit by the waterside and enjoy it while listening to the music of some of the city's top bands. A separate section of the festival site, on the neutral ground (median) of Jefferson Davis Parkway, is designated for craft booths where talented artists and artisans display and sell their works. The entire festival is free and open to the public, and much of the proceeds at the festival go towards charitable organizations and events. With the tree-lined streets and avenues, gathering places, and landmarks, the Mid-City and Bayou St John neighborhoods are decidedly more tranquil than their downtown counterparts. Above the French Quarter and below the lakefront, neither Uptown nor quite downtown, Mid-City embraces everything from the massive, lush City Park to storefronts along Broad Street. Much of this neighborhood was low-lying swamplands until the late 1800s, and you can still see where the "high ground" was, along the Esplanade Ridge (now Esplanade Avenue). These are the stretches with many of the largest historic houses, churches, and landmarks. Along Carrollton Avenue you can find everything from an old-school Italian ice-cream parlor, to a variety of restaurants. The neighborhood hosts more than a dozen festivals and celebrations each year. It's easy to figure out which festival is approaching by the bright flags that spring up on people's porches. St John Trace represents all that New Orleans has to offer. The style, charm, character, look and feel of each house is true to the New Orleans style and the community will be one that embodies the spirit of New Orleans. The friendly demeanor, laid back style and southern charm that makes New Orleans so unique will shine through, making this community one of the preeminent places to live in New Orleans.